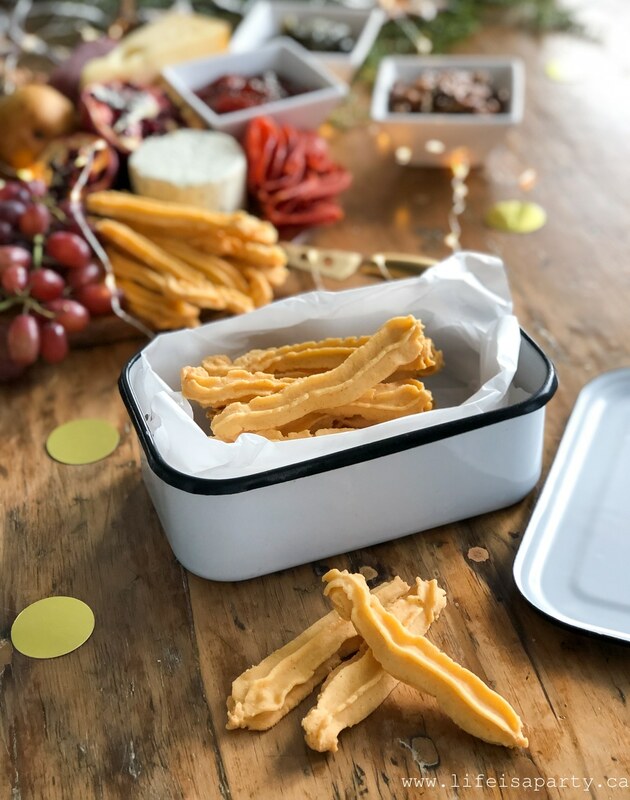 Cheese Straws Recipe: spicy and savoury cheese shortbread straws, perfect for gift giving or as part of a charcuterie board. I first tried cheese straws one day when I was at a West Indian bakery. My husband is from Guyana, and we would sometimes go there for some Guyanese treats. Cheese straws are like a savoury, spicy cheese shortbread. They are buttery and crisp like the best shortbread, but also cheesy tasting, and then they have a little heat to them too. They’re kind of perfect. 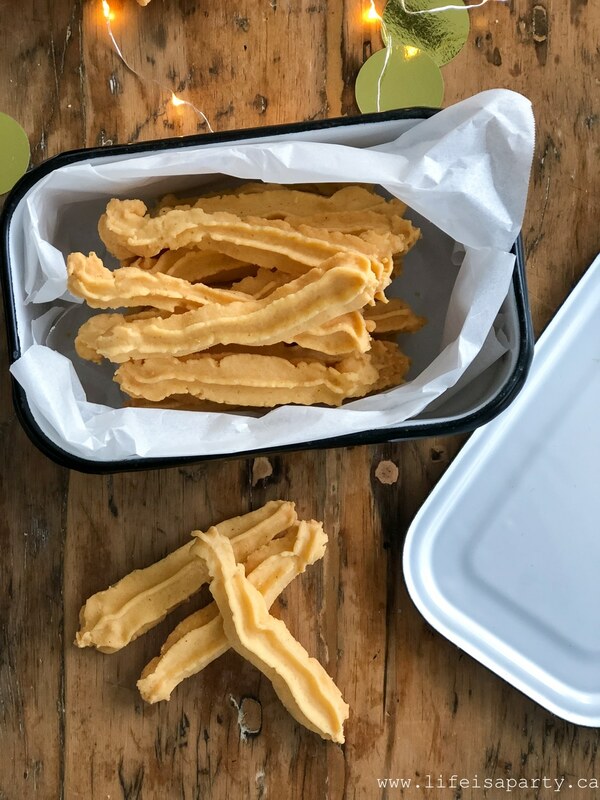 If you’re looking for a savoury home made gift for someone special, these spicy cheese straws are perfect. A home made food treat is the great gift -since lots of people don’t have time to cook or bake these days, it doesn’t add clutter to anyone’s house, and tastes delicious! I love cheese straws as part of a cheese board around the holidays, or even served with a soup. They’re also great for snacking. 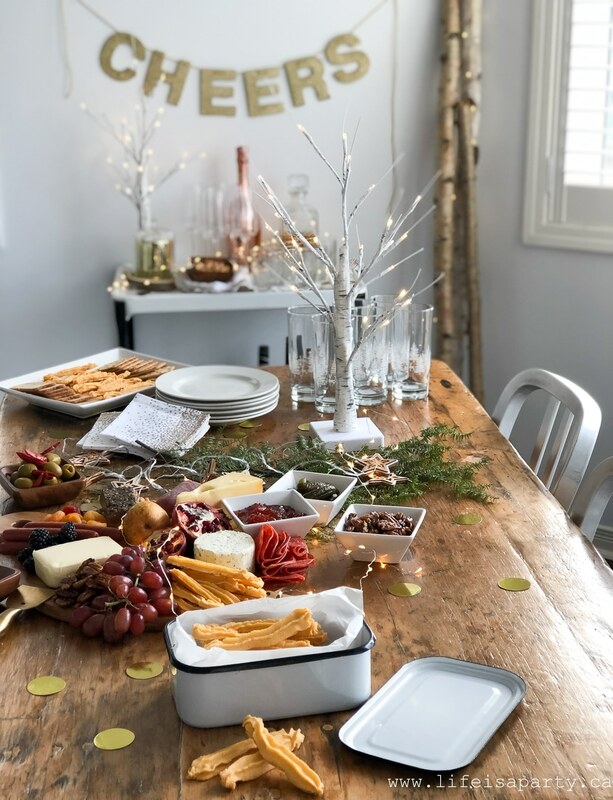 I’m sharing the cheese straws today as part of the Seasonal Simplicity Christmas series, so be sure to check out all the other amazing DIY Holiday Gift Ideas linked at the end of this post. You are going to need a cookie press for this job, but other than that it’s pretty straight forward. Grate sharp cheddar cheese with the fine side of the grater. 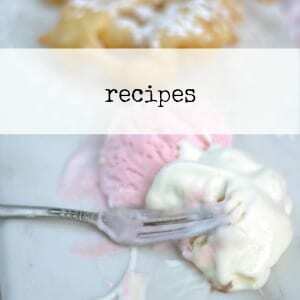 In a stand mixer cream together the butter and grated cheese, until the mixture is well mixed and fluffy. In a another bowl combine the flour, salt, and cayenne pepper -1/4 tsp if you don't like it too spicy, or up to a 1/2 tsp if you like a lot of heat. Using a whisk, whisk together the flour, salt, and pepper. Then slowly add the flour mixture to the butter and cheese mixture in the stand mixer. Beat the dough on high for about 5 min. until the dough is very creamy. Be sure to scrape down the sides and bottom of the bowl occasionally. Put your dough in a cookie press, and pipe about 3 inch straws onto an uncreased cookie sheet. Bake 12-15 minutes until slightly browed. 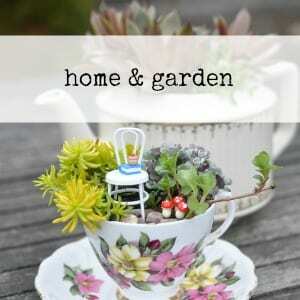 Cool and store in an airtight container. 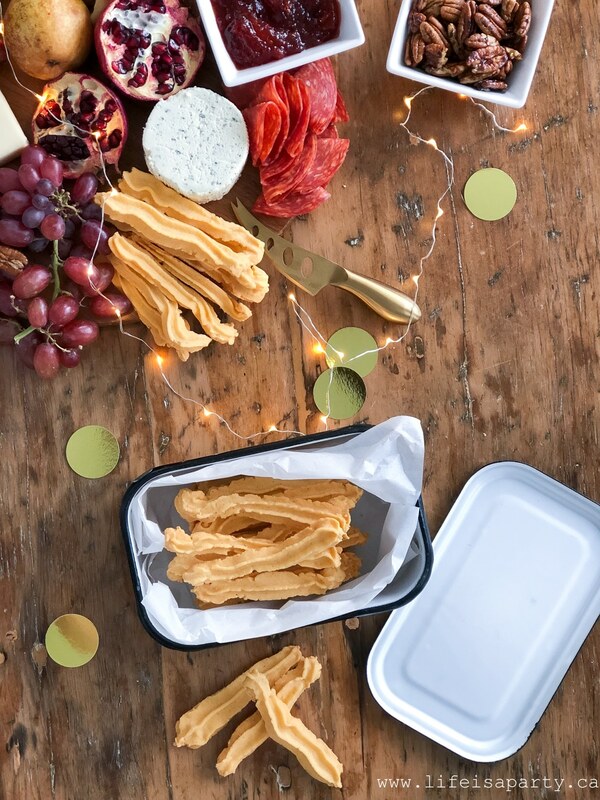 For gift giving, wrap up the cheese straws in a cello bag, or bakery box. Or to make it extra special, use a vintage container, like this enamelware refrigerator box. Combine the cheese straws with a beautiful bottle of wine, some cheese, and chutney -or just give them on their own. I used some of my cheese straws for a beautiful charcuterie board. 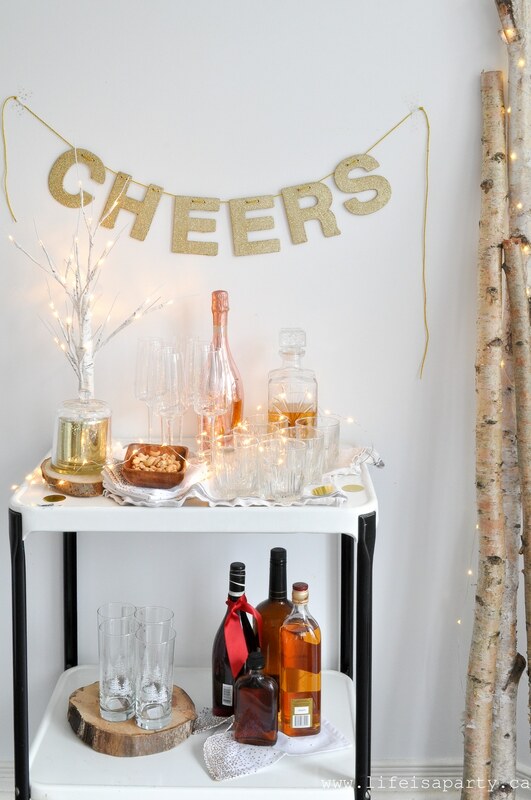 I love this style of entertaining over the holidays. 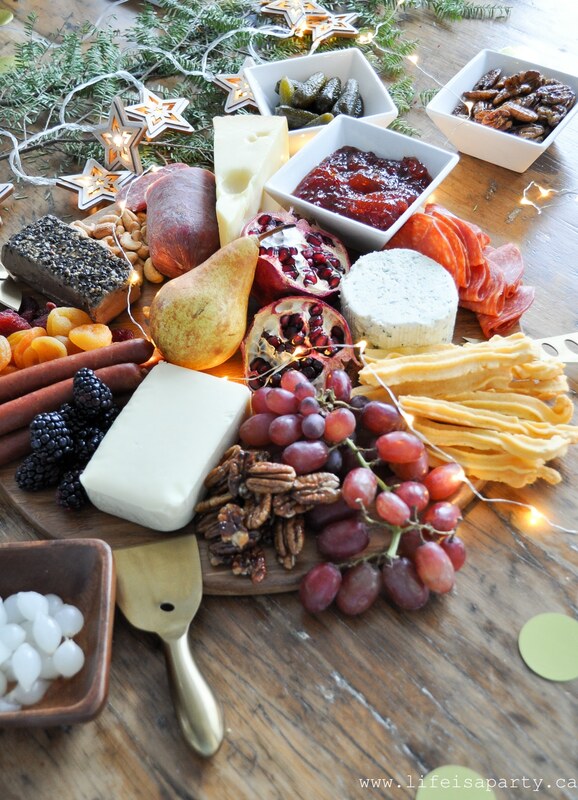 Create an amazing cheese board with something for everyone, and let guests help themselves throughout the whole party. 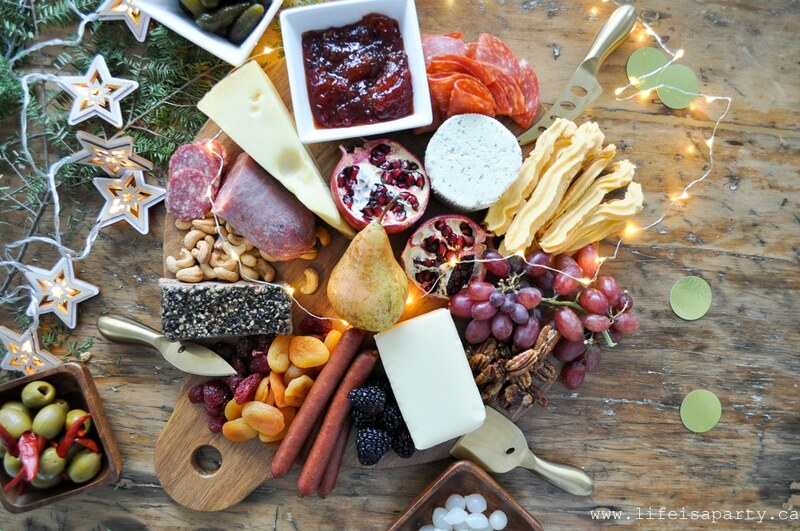 For an amazing charcuterie board think about including different flavours and textures -sweet, creamy, sour, spicy, salty. Cheese -we used a swiss cheese, harvarti cheese, and a soft cheese, think of different textures, and be sure to include everyones favourites too. Meat -we used a mild salami, a spicy salami, some turkey pepperoni sticks, and a peppercorn pate. Fruit -we used grapes, pears, pomegranate, blackberries, and some dried apricots and dried strawberries. Pickles and Condiments: -we included some pickled onions, gherkins, stuffed olives, and a pepper honey. I often include a grainy mustard, and a onion jam as well. Nuts -salted roasted cashews, and spicy maple pecans. And don’t forget some crackers, and breads, and of course our Cheese Straws. And what goes great with our Cheese Straws and the charcuterie board? 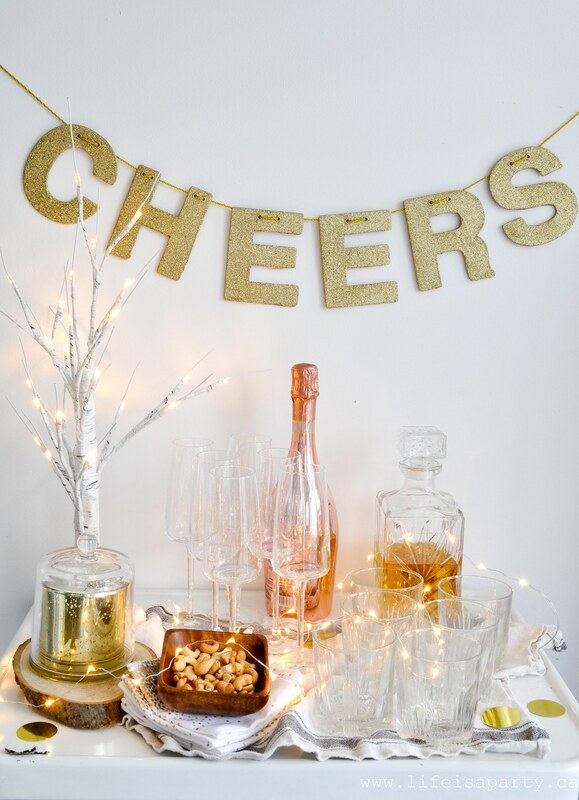 A little bubbly, or something else to wet your whistle. 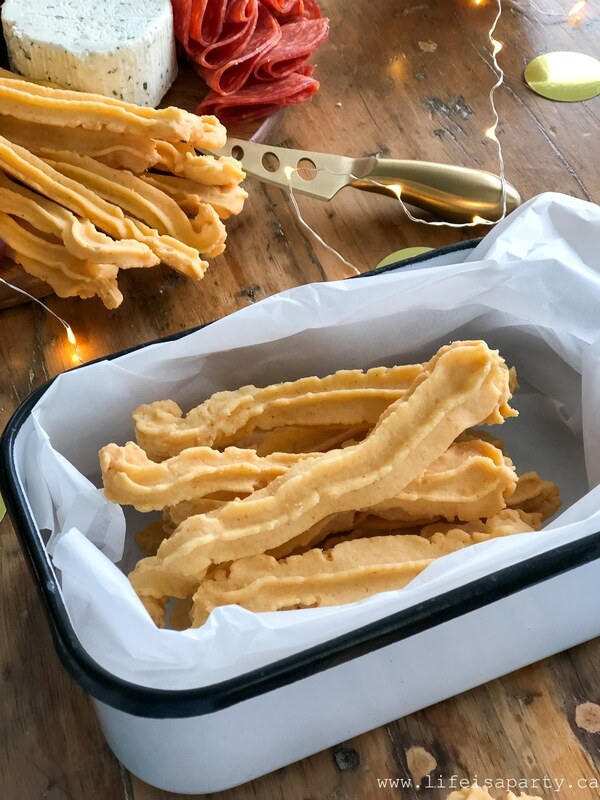 I hope you enjoy these delicious cheese straws -spicy or not so spicy, for all your holiday home made gift giving, and entertaining. 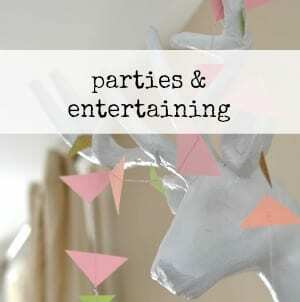 With home made Cheese Straws, life really is a party! 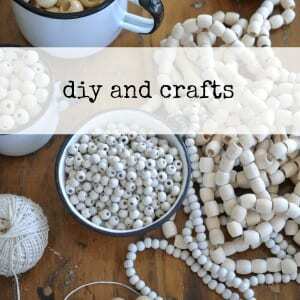 And now are you ready for whole lot of inspiration for DIY Gifts for the Holidays? These sounds delicious! My kids would love them! 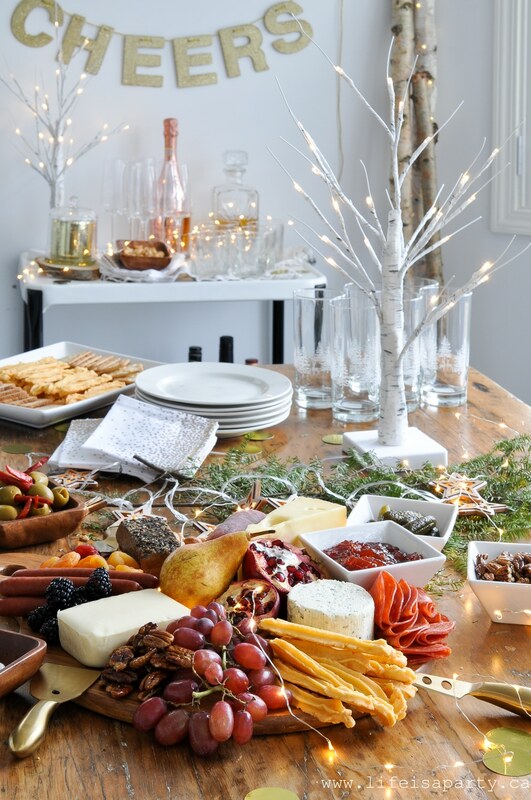 And your table setting and charcuterie board are beautiful! 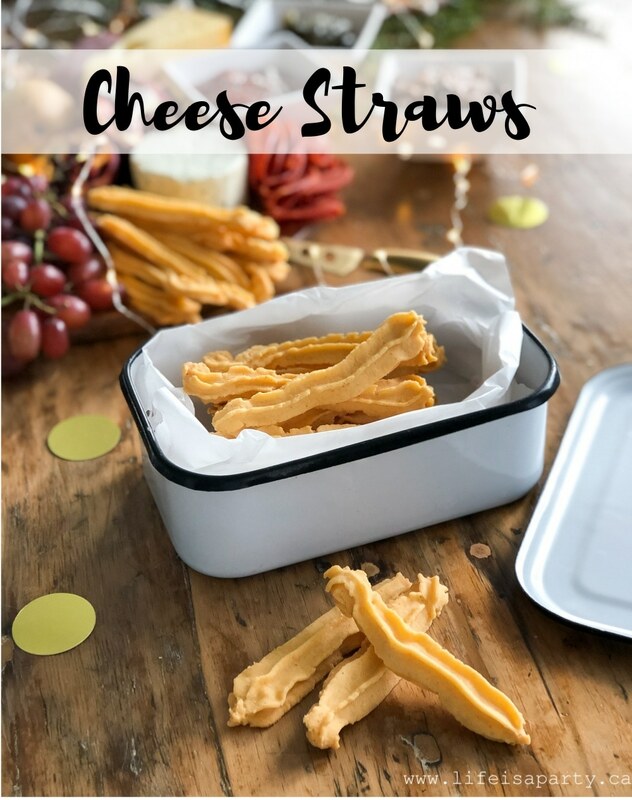 The cheese straws look delicious and so easy to make. 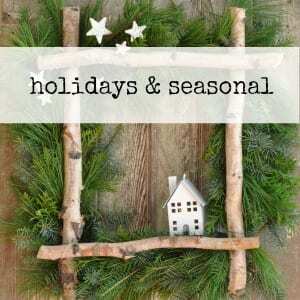 Thank you for sharing and being a part of the blog hop. This looks so yummy! Thank you for sharing the recipe! Jo-Anna you do need to make these, they’re a favourite of mine and so good!